(CNN)Sudan’s ruling military council will prosecute deposed President Omar al-Bashir but will not extradite him, a military officer said Friday. In a press conference, the head of transitional military council’s political committee Lt. General Omar Zein Alabedin vowed to try Bashir, forced out of power in a military coup on Thursday morning, and said that the army would help pave the path to democratic transition. Bashir faces five counts of crimes against humanity and two counts of war crimes at the International Criminal Court (ICC) in The Hague in connection with Sudanese military actions in Darfur between 2003 and 2008. Sudan’s President Omar al-Bashir looks on as he receives his Egyptian counterpart at Khartoum International Airport outside the Sudanese capital on October 25, 2018. The United Nations human rights office called on Sudan on Friday to cooperate with the ICC. “We do encourage the authorities in Sudan to fully cooperate with the ICC. There is a Security Council resolution as far back as 2005 calling on the government of Sudan to fully cooperate with and provide assistance,” UN human rights spokeswoman Ravina Shamdasani said in a Geneva press briefing. Protesters who rushed on to the streets to celebrate the ouster of the Sudanese strongman are facing the prospect of a long struggle ahead as the military figures who ended his 30-year rule seem to be preparing to hang on to power. As news of Bashir’s downfall was still reverberating around the world, a military council dissolved the government, suspended the country’s constitution and declared a three-month state of emergency. The military said it will remain in control for at least two years to oversee a “transition of power,” leading to dismay from protesters and outside observers that elections will not be held anytime soon. On Thursday, regime forces and regime-aligned militia killed 13 peaceful protesters with live ammunition, according to the Central Committee of Sudan Doctors. Two of the dead were killed in Khartoum, one dead in Atbara and eight were killed in Darfur, according to CCSD. On Thursday, protesters celebrating their victory over Bashir quickly turned to chanting against the country’s defense minister, Awad Mohamed Ahmed Ibn Auf, who made a statement explaining the military’s seizure of power on state TV. Ibn Auf was sworn in as head of the military transitional council hours later. “The people want to topple Ibn Auf,” a crowd chanted in Khartoum. The group that has been leading the anti-government protests, the Sudanese Professionals Association, or SPA, rejected the “coup declaration,” and has called on people to press on with demonstrations and to stage a sit-in outside military headquarters. “All Sudanese people are in the street and demanding the downfall of the regime and not recycling the same people,” he said. The US said Thursday that it had ordered the departure of all non-emergency US government personnel from Sudan following the coup against President Bashir. The State Department also raised its travel advisory to the highest level — Level 4: Do Not Travel. 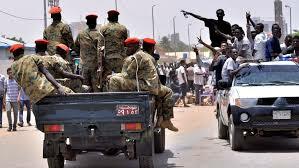 Human Rights Watch associate Africa director Jehanne Henry said how the new Sudanese authorities handled protests against them would be a key “test” for the new regime. On Friday morning, the UN Security Council is set to discuss developments in Sudan in closed door discussions, according to the United Kingdom Mission to the United Nations. Bashir took control after a coup in 1989 and became President in 1993. He stands accused of conducting a campaign of ethnic cleansing in the country’s Darfur region, and was nearly arrested in 2015 while visiting South Africa. At 3:30 a.m. Thursday, Bashir was visited by the heads of his four main security apparatuses and was told “there was no alternative” but for him to step down, two senior military sources with direct knowledge of the conversation told CNN. According to the sources, Bashir responded by saying “with the blessings of God,” an expression of acquiescence in Islamic tradition. Bashir is under house arrest, according to sources. His personal guard has been replaced and is under close watch, sources added. Sudanese Prime Minister Mohamed Taher Ayala and Ahmed Haroun, the head of the ruling National Congress Party, were among dozens of officials who were also arrested, a top military official with direct knowledge of the arrests told CNN. CNN’s stringer in Khartoum witnessed military troops storming the Islamic Movement headquarters, the main component of the ruling party. The Sudanese Intelligence Agency said it ordered the release of all political detainees, the official Sudan News Agency, or SUNA, reported Thursday. More than 3,000 people have been arrested since protests began in December, based on testimony CNN gathered from activists, lawyers and victims.